Prayer is not to manipulate God, nor is it to change His mind. We should seek that our will may be changed into His will through prayer. Even sometimes, in secret or in emotional rush, we pray to God and make promises to do better and to overcome our sins. We must learn that prayer is more than a conversation with God, or random words we say or hastily think of and send them in God’s direction. We may have a handful of wishes in our hearts, but not all of these are ‘worthy’ to go to God in prayer. When we present our requests to God, we give God the upper hand to choose whether He will grant or deny our request. True humility accepts God’s outcome as good, because it tells of a heart that accepts His will and trusts His control and omniscience. Omnipotent: (of a deity) having unlimited power; able to do anything; all-powerful; almighty, supreme, preeminent. Omnipresent: (of God) present everywhere at the same time; all-pervasive, everywhere; widely or constantly encountered; common or widespread. The Lord wants to know all of our petitions, and that we give Him our concerns and anxieties. He wants us to talk to Him, but He also wants to talk to us. We can talk to God, but if we find that we are in a one way conversation, we may very much not be in sync to receive from God after all. It takes 2 to have a conversation, as with any conversation, God also wants to speak. The purpose of prayer should be to determine the will of God and to receive from Him. I have always been told that I am good listener, and I always wondered what it meant… until I found people who did not listen to me. And when I come before God, I come in silence before uttering any praise or worship like words. It is offensive to feel dismissed or ignored, yet many people are guilty of both. Most people truly do listen to respond, they are not really listening: they are talking in their minds. The bible says that we need to careful when we worship God and when we offer sacrifices. God values silence, the book of Proverbs honors silence. “Even a fool is consider wise when he keeps quiet” (Proverbs 17:28). The bible says that too many words, bring about sin- and this, to God, is foolish. 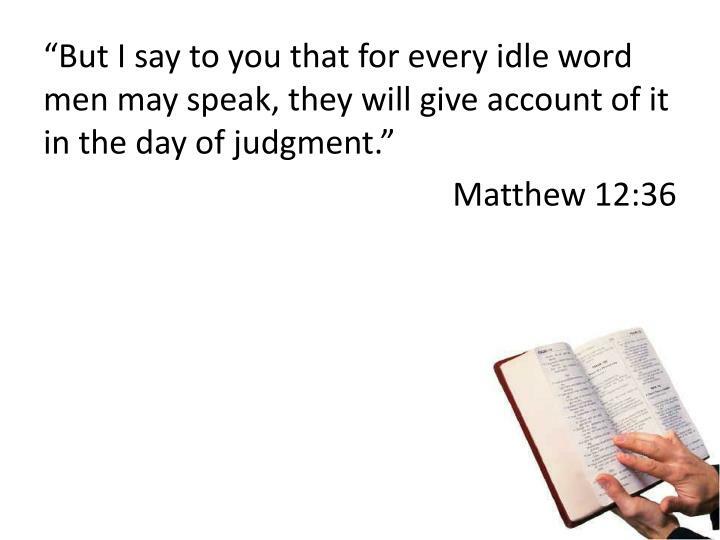 We will be judged for every word that comes out of our mouths, including idle words. People who ramble, speak with no purpose and unending details lack prudence. And it is of extreme importance to know when and how to speak, because we live in an extremely diverse world. In a similar way, we must know that there is an appropriate way to come before God, we are to present our petitions, with an attitude of humility and honor. An attitude of humility, is an attitude that asks ‘could you or may you‘, leaving the option up to God (or some other counterpart). Unlike pride or arrogance where there is a demand for a response and usually a self centered response, or the attitude of distrust where matters are taken into our own efforts. We must come to God with respect. God is in heaven, and we are on the earth: He is the creator, we are the created. We should respect God by standing in silence before Him, He does not need us to rush our time with Him- and He does not desire empty words either. God is similar to us in this area, He does not want promises: He wants to be listened to. Lord Jesus, you know our hearts better than we know ourselves. You know the way our minds work, our struggles and what makes us upset- I pray you give us peace in the midst of noise and restless times. May we contemplate your beauty, and adore you in silence; may we not be eager to please you than we are eager to contemplate your perfect love and beauty. May our loved ones experience your peace, your still voice and you presence. In Jesus name, Amen.